#LoveOthers14 - Can One Small Initiative Make A Difference? Inspired by the #LoveOthers14 initiatives done by the Heart of God Church youths, Lawrence and his church friends came together to carry out their own initiative. 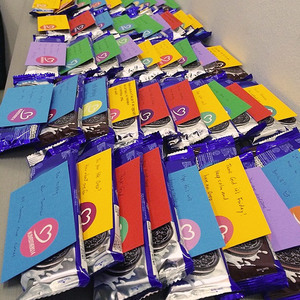 After work, they bought hundreds of packets of Oreo biscuits and stuck encouraging post-it notes on every single one. They then headed to Eunos MRT, wanting to give out these sweet treats to commuters to cheer them up at the end of a long day. Most people were pleasantly surprised by their small acts of kindness, but one of them was particularly moved. Lawrence recalls handing out a packet of Oreos to a man. Five minutes later, the man returns, walks up to Lawrence and says: “You have no idea how much this means to me – I just got fired from my job today.” He then smiled at Lawrence and walked away. Lawrence and his friends went home with their hearts full that night. Their small initiative had made a huge difference in at least one person’s life, and that was all that mattered.